Have you ever had a rich, creamy, buttery, sweet fluffy piece of heaven with a sugary crust? I have. TWICE. And it was vegan. My husband and I were lucky enough to be invited to the Vendy Awards this weekend at Governor’s Island in NYC. And we thoroughly enjoyed ourselves. The ferry ride to Governor’s Island was fun. Scenery was beautiful. The food was great. Drinks were flowing. And believe it or not, I didn’t even know where or what Governor’s Island was until this weekend. It’s kinda embarrassing, considering I’ve been living in the city for over 5 years. 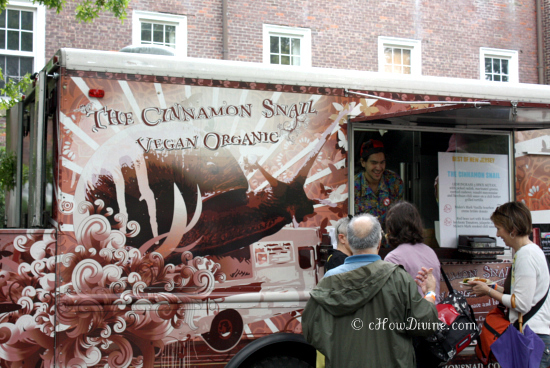 The most delicious thing I had at the Vendy Awards was the Maker’s Mark Vanilla bourbon crème brûlée donut from The Cinnamon Snail – an organic vegan food truck from New Jersey. My husband, who is faaaar from being a vegan, agreed with me. It tasted so decadent. 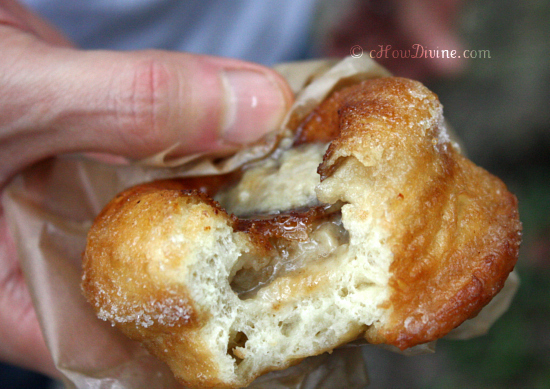 It had all the creaminess of a full dairy + egg crème brûlée in a fluffy soft donut. And it had the yummiest caramelized sugar crust on it. It really was a fluffy, creamy, sweet piece of heaven. I went back for seconds. And my husband practically had to tackle me to the ground to keep me from going back for a third one. It was that good. 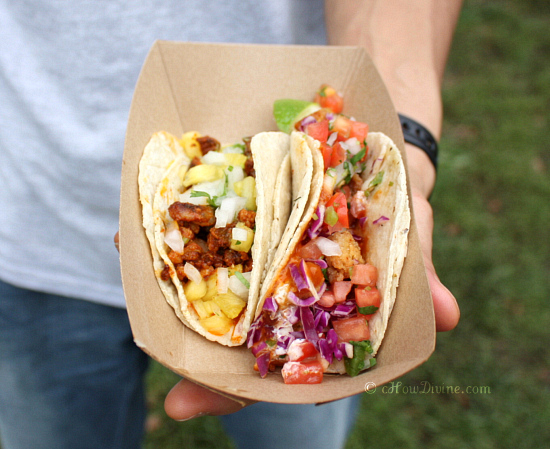 My favorite non-sweet/non-dessert food was the pescado taco – crispy catfish taco – from The Taco Truck, a food truck from New Jersey. Go figure. My favorites at the NYC Vendy Awards were from New Jersey. But the souvlaki pita from Souvlaki GR, located in lower Manhattan, was a very close second. They were both delicious with amazing creamy sauces, but I’ve always had a weakness for fried foods. And the catfish from The Taco Truck was fried to crispy perfection. Don’t get me wrong. The dishes from other vendors were great also. But these are the dishes that I would request for my last meal if I had to choose it from the 2011 Vendy Awards menu. I’m including some of the other notable dishes from the Vendy Awards. 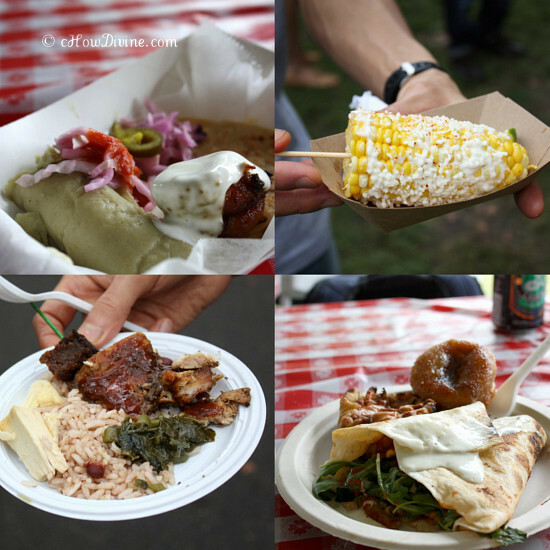 Clockwise from top left: pupusa, tamale, and sides (“Sample Platter”) from Solber Pupusas; Mexican corn on the cob (“Elotes”) from The Taco Truck; lemongrass-seitan tortilla wrap, red bean tart, and crème brûlée donut (yay!) from The Cinnamon Snail; and jerk chicken with sides from the Sunrise Grill. Here are some more notable dishes. 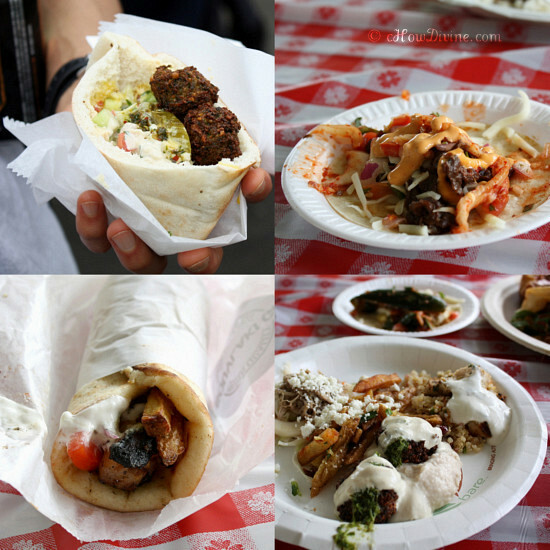 Clockwise from top left: falafel sandwich from Taim Mobile – Falafel & Smoothie Truck; bulgogi and kimchi taco (“Ribeye of the Tiger”) from Korilla BBQ; falafel balls and hummus with sides (“Sampler Platter”) from Two Pitas in a Pod; and the souvlaki pita from Souvlaki GR. There was also a memorable dessert from a vendor called Woolys. I couldn’t take a picture of it, because I scarfed it down before I had the chance to take a photo. They were serving shaved ice with fresh strawberries, brownies, and sea salt leche sauce. I’ve had Korean shaved ice (paatbingsoo), but the texture was different – good different. Instead of the powdery shaved ice, theirs consisted of really thin strips of shaved ice. The shaved ice held their shape for a longer period of time, but was still very delicate. The sauce was also delicious; it tasted rich, yet light at the same time. I admit I overindulged. I am terribly lactose intolerant, and gluten makes me feel all kinds of weird. But this happens only once a year, and I couldn’t resist. I had to take a fistful of digestive aids. And I think I’m still digesting the food today. But it was totally worth it. I’m already looking forward to next year!